I’ve been knitting away this month to put together a neat little prize package for BlytheLife.com’s 5th Birthday Giveaway! While this isn’t everything (there will be a few additional items that I’m still brainstorming about), and not everything is finished yet (snaps! ), it’s a quick little snapshot of what one lucky winner will be getting! As mentioned, every non-spam comment this month, until end of day July 30th, will count as an entry towards the giveaway, and then I’ll see who wins and announce on Friday, July 31st. Happy commenting! Kittyrobot Custom Pullrings Giveaway: The Winners! Ahhh they’re so cute! I wish I could knit! I have a few crocheted things that need snaps, but… I don’t like sewing :(. They are very cute. 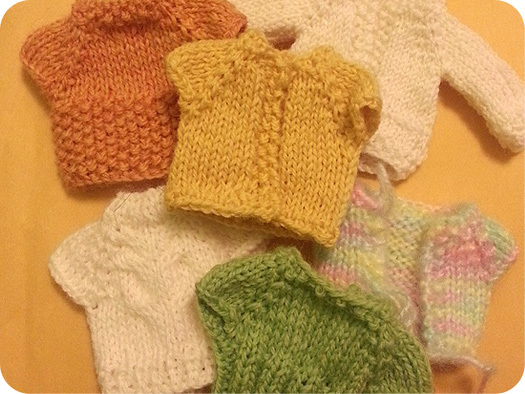 I wish I could knit, it would be amazing to make such cute little things for my dolls. This is so cool! I hope i win, i had to make a new email, cuz my old one was acting funny, so this is my email address! Thanks again Michelle! Awe, I love the colors! Will look good with every hair color and mixing and matching!